Whether you are a farmer or a contractor, it provides the efficiency you need! The new XT generation is pushing back the limits of performance. With working widths up to 50 m for granules and maximum capacities of 15,500 litres, these trailed fertiliser spreaders offer unrivalled productivity. At ease on the road and fields alike, the XT is approved to travel with a full hopper. With fertiliser granules, work on widths from 18 to 50 m in mechanical drive. For granulates, benefit from a proven mechanism, tested on mounted spreaders, with record levels of autonomy. The granulate discs are equipped as standard with Epsilon vane system = 2 jets per vane for complete overlap. For example, 90 ha per hour, spreading 300 kg/ha at 18 km/h over a working width of 50 m.
Belt driven mechanically by crown wheel and pinion, for an application rate that is strictly proportional to the forward speed and completely unaffected by slippage, whatever the plot contours. 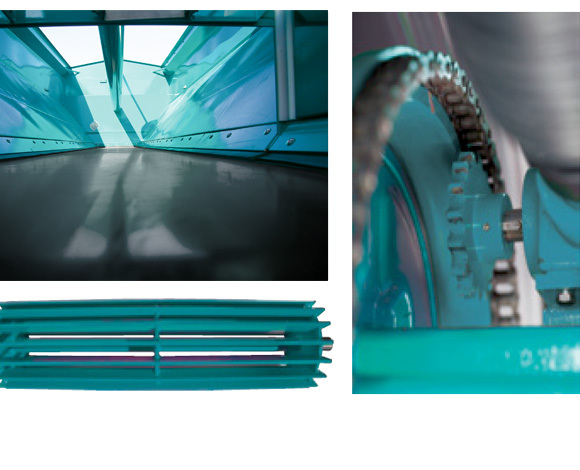 800 mm-wide feeder belt with permanent self-centring mechanism (cylindro-conical drive bearings) and hopper inclinations that are ideally suited to the flow of products stored in bulk. 6 spreading sections and all combinations possible. ** – 15/55 for application rate < 1800 litres/ha on 12 m with VH and powders and for application rate < 500 l/ha on 24 m with pellets. -27/43 for 1800 < application rate < 3500 litres /ha on 12 m with VH and powders and for 100 < application rate < 1150 l/ha on 24 m with pellets. 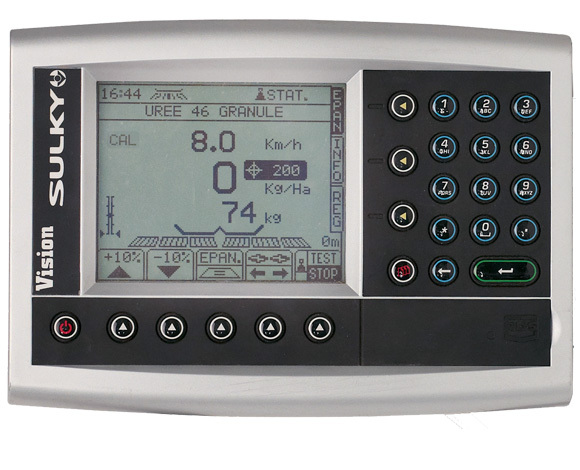 – 43/27 for max 20,000 l/ha on 6 m with calibrated organic density <0.7.